Gwyneth is part of an extremely gifted family, a family of time-travelers. However, not everyone in this family possesses this special talent. It has been long suspected that Gwyneth’s cousin, Charlotte, has been chosen to possess this gift. They soon discover that Gwyneth is to be the final time-traveler in her family lineage. She has never been prepared to carry out such a talent nor the details of everything it entails, and must rush to learn everything she can within a short period of time. Luckily, Gwyneth is not alone. Gideon is from another long line of time-travelers, and will be her partner to travel through time with. Gwyneth and Gideon aren’t so fond of one another at first, although, as time progresses they become tolerant of one another and learn to work as a team. Together they begin an incredible journey and enter the 18th century London time. What will they discover when they enter this historical era? Ruby Red is the first installment in this trilogy, followed by Sapphire Blue and Emerald Green. As some of you may already know this trilogy was originally released Germany as the “Edelstein Trilogie” and is currently being translated one book at a time. My favorite element of Ruby Red is definitely the time-travel factor. I have read a few time-travelling themed books, and this story was fun and very enjoyable with its own unique twist. As for the characters, Gwyneth was the most relatable. She’s funny, quirky, and very down to earth. Her character starts off as being your average girl, nothing really exciting in her life, then she faces something incredible and has to go into it head first with no other options. With a little bit of romance and history thrown into the equation, this is definitely a wonderful read. I’m looking forward to the next installment of this trilogy. 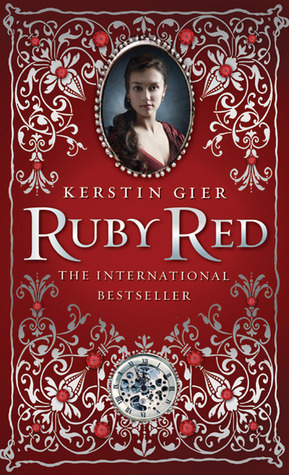 I recommend Ruby Red to those who enjoy Young Adult Fiction, with historical and time-travel elements. Thank you for giving me the opportunity to read and review this for you Tynga! Lucy, you always bring such great reviews to the blog! I'd never heard of this trilogy before but it sounds wonderful. Thanks for the review! Great review! I'm reading this right now and can't wait to see where Gwyneth and Gideon will time travel back to. OOh nice review!! I've had this one on my TBR mountain for awhile now! I really hope to get to it soon! I've enjoyed a good amount of time travel books as well! I am def not into YA, but this one sounds nice. I absolutely loved Ruby Red and no I didn't know it was a trilogy. That's awesome thank you for sharing that. The time travel in this book was really cool and unique. The history side was so detailed and the people Gwen and Gideon meet were very interesting. I definitely can't wait til Sapphire Blue comes out. I can just tell Ruby Red was just the start and the next two books everything will be heating up. I'm glad I could share something new hehe :). Definitely agree with you! Looking forward to hearing your thoughts on the next installments! I have tried a few time traveling books and they worked and didn't work at the same time. I think that the author can't make it too complicated because that loses me very quickly. I'm glad that there seemed to be a great setting for this one and a touch of romance is exactly how I like YA books. I completely agree! If things get too complicated, the story won't be as enjoyable! I really want to read this book - here in Poland is loud about this author :). Yes, Gier is from Germany :). I read a lot of positive reviews, so now I must go to bookshop and buy all three books from this trilogy. I hope I will enjoy it :). Somehow I missed that this book involves time travel which immediately raises my interest in it-I love time travel and am excited to see how this book handles it! Have you seen the new cover design? It's awesome!